The Milwaukee PianoTeams® is a group of six piano teachers, all currently training with N. Jane Tan's Well Prepared Pianist Institute in Milwaukee, Wisconsin, one of several training centers in the United States. Thirty teachers meet once a month for three intensives days of study with the distinguished faculty, which includes N. Jane Tan, Seymour Bernstein, and Paul Pollei. PianoTeams® ensembles (five pianos-10 hands), one facet of the program, were developed to teach "street smart" musicianship. They add a much needed social element of fun and camaraderie to piano study at all levels, including the most advanced. 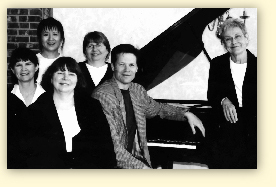 Performing both original works and arrangements of classic repertoire, the Milwaukee Teachers PianoTeams® has performed at the MTNA National Convention, and was featured at the Texas Music Teachers National Convention in an evening concert in June 2002. Team member Barbara Bunge is a past president of the Milwaukee Music Teachers Association. A graduate of Alverno College's piano performance program, she founded and directed their Young People's Art Program, for which she received an Arts Educator of the Year award. Dan Dance attended the Wisconsin College Conservatory and the University of Denver as a jazz piano major. He has appeared on Prairie Home Companion, "E" Town, and as a guest artist with the Ludwig International Percussion Symposium. He performs frequently in the Milwaukee area. Laura Eiche has been teaching piano and performing in the Milwaukee area since receiving her Masters of Music degree from the University of Wisconsin. She studied with Carroll Chilton, Howard Karp and Jack Radunsky. Pru Palecek studied piano at the University of Wisconsin and at the Academy of Music and Dramatic Arts, Vienna, Austria. Her sister, Susan Sonneborn, received her bachelor's in piano performance from Lawrence University and her M.A. in music theory from the University of Wisconsin. Besides teaching privately, together they collaborate in a summer piano ensemble camp. Naoko Wallace got her bachelor's degree in music in her native Japan, and her master's in piano performance from the University of Wisconsin-Milwaukee, where she specialized in ensemble music and studied with Judit Jaimes. Besides teaching, she is involved in both chamber music and church music.